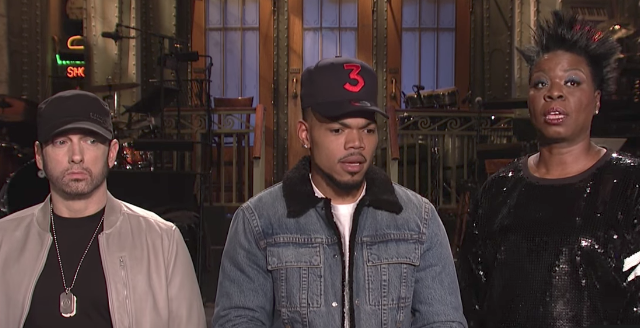 The upcoming episode of Saturday Night Live is going to be weird: Chance the Rapper is the host and apparently wrote between three and five of the skits, and Eminem is the musical guest. It remains to be seen what sort of bizarre collaboration between the two will come out of this, musical or otherwise. For now, though, we have the obligatory SNL promo clip to be made uncomfortable by. Eminem makes crazy eyes at the camera before delivering odd pokerfaced punchlines with assistance from Leslie Jones. There is, of course, a bit where he takes issue with Chance calling himself “the rapper.” Eminem’s resilient young-father-at-Home-Depot look–the chinstrappy beard, long sideburns, and engineer’s cap–is also pretty disconcerting here. Watch below.